Peggy's family is hosting a barbecue for their neighbours, the Dawson's. Peggy isn't too sure about those Dawson boys. 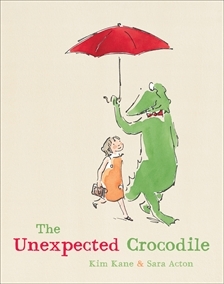 But she's delighted when an unexpected crocodile invites himself to tea...with unexpected consequences! This is the second of my favourite 'animal eating people' picture books for this month. Unlike the lion in In the Lion, the crocodile in this story is a little more discerning when it come to who he puts in his mouth! This book is a little bit odd, and I do have to wonder of it's not written more for adults than children, adults who have played host to annoying guests at dinner parties! Odd does not equal bad, in fact for me, it's the odd books that stand out and stay in my memory. The weather has been bad in Peggy's town, the excessive rain has left everything waterlogged. Not the perfect conditions for a dinner party, and Peggy's mother is a little stressed. The Dawson's are coming to dinner and the Dawson family, it seems, are an annoyingly perfect and hard to please family who live next door, with three small boys. A surprise guest (the unexpected crocodile) has heard that the Peggy's family will be 'having the Dawson's for dinner', and he hopes to join them. The wording there gives a little away of what is to come. As the evening unfolds we start to get an impression of the Dawson's (rude and cheeky little boys, oblivious parents), and this behaviour does not go unnoticed by the crocodile, and he proceeds to eat the Dawson's, starting with the Mrs Dawson, Mr Dawson and all three of the little Dawson's leaving nothing but their gumboots. 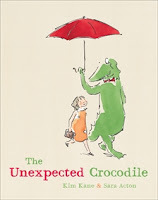 The oddness of this book continues after the crocodile has gone home, and Peggy's mother is doing the dishes and wonders, 'what's so special about the Dawson's?' Maybe it was the gumboots? It's difficult to put an age recommendation on a book like this, that's why I have labelled it from age 5 -10. I think the appeal will depend far more on the readers individual sense of humour as opposed to a specific age group.